As a mom of 2 kids, I’m lucky if I make time to wash my hair, let alone use a hair dryer and flat iron. I know plenty of moms who have gorgeous hair that is perfectly styled – I’ve been meaning to investigate where they find the time but I’m too lazy. And I’m sure once I figured it out, my hair would get destroyed my peanut-covered fingers or a 14-month-old baby whose favorite pastime is yanking on my hair. But a few days ago, the hubby and I were both in a wedding, and that meant for once, I needed the perfectly styled hair. So I whipped out a hair dryer (drying my hair for the first time in months – possibly years) and started heating up the GHD flat iron. First off, this thing is a beauty – a work of art. 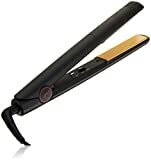 I first heard of the GHD flat iron back in college when I was studying abroad in England. My flatmates (roommates) introduced me to GHD when I was a young, ignorant college student who still used a curling iron to style my hair. The GHD flat iron – like many other flat irons on the market now – can do pretty much anything. You want curls, way, straight hair – you name it you can have it. And it heats up within 30 seconds. I was in a wedding with a time crunch, so I can verify it’s accurate. What’s really impressive is that at first, I wanted to have my hair sleek and straight for the wedding. So of course, I straightened it to a gorgeous frizz-free shine. But then after putting on my matron of honor dress, I realized it didn’t work as well. Now, I’ve already straightened my hair, so trying to create some waves with the flat iron sounds like failure waiting to happen. But I had to try. Here’s what’s impressive, I actually succeeded. I managed to create some wavy locks that looked so amazing that it made me want to do my hair more often. When combined with make-up and a gorgeous floor-length dress, I barely recognized me from the pajama-wearing and scrunchie-haired mom with chocolate stains on her shirts. Most people turn off the flat iron so you don’t potentially burn things down. But if you’re me and rushing downstairs an hour before the wedding to frantically find the marriage certificate that has gone AWOL because the wedding officiant needs it, sometimes you forget to turn off the flat iron. Thankfully, the GHD flat iron automatically turns off on its own. I was curious after, did I forget and turn it off myself? So I tested it out, intentionally leaving it on for 1 hour at home. When I came back, it wasn’t hot. I tried out the GHD classic flat iron, but they’ve got a number of different options. I also took a peek at some of their newest GHD flat irons, including the GHD Gold flat iron, which has new dual-zone technology, aka, heat sensors across each plate. There are cheaper flat irons on the market, but the automatic shut off feature and the fact that it heats up to 365 degrees in 30 seconds (25 seconds with their newest Gold models) means you get the ideal heat to mold hair without frying it. There’s also some fancy technology underneath those 365 degree plates: sensors that measure the density of the hair in the iron, so that it can maintain consistent heat regardless of how much hair you grabbed. Worth it. My hair looked amazing at the wedding and it didn’t take very long to get that great wavy haired look. Which is good, because I was operating under a very small amount of time. I didn’t upstage the bride by any means, but I still pulled off a great Matron-of-honor look. Thanks GHD!